The fact is I am quite happy in a movie, even a bad movie. Following the back to back awards for biopics, the Academy moved to the world of adaptation. Hollywood, and the film industry in general, was no stranger to adaptation, but prior to 1937, the only adapted films to win Outstanding Production were based on little-known short stories or forgettable novels (e.g. It Happened One Night, Cavalcade). 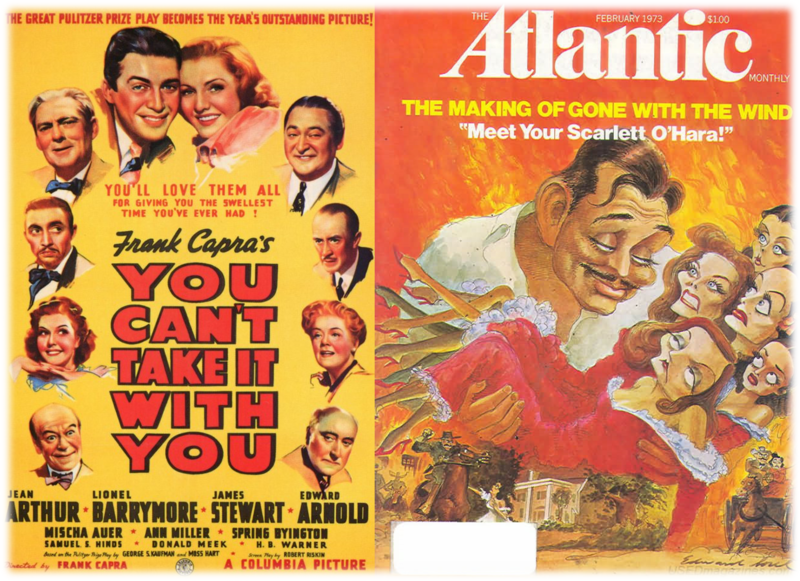 But with the next two winners, the Academy went with two Pulitzer Prize-winning works, one a long-running Broadway hit, the other a best-selling novel. Both films were popular with audiences and critics, both boasted star-studded casts and talented directors, but time has been far kinder to one of them than it has the other. When Columbia purchased the rights to George S. Kaufman and Moss Hart’s You Can’t Take It With You, it made complete sense. Under Kaufman’s direction, the play had enjoyed enormous success on Broadway on its way to winning the Pulitzer. Columbia bought the rights while the play was still running, cast Lionel Barrymore, Jean Arthur, and Jimmy Stewart to star, and handed over directing duties to Frank Capra, who had won Best Director twice in four years. The film was quickly shot and actually released while the play was still in production on Broadway. It became a box office hit and earned critical acclaim, earning five Oscar nominations in addition to its wins for Outstanding Production and Best Director. The film version wasn’t simply a filmed version of the play. In the play, all of the action takes place in the Vanderhof/Sycamore home, specifically in the living room. However, in the film, the audience accompanies Alice and Tony on their dates, sees Kirby at work in his office, and visits the cast in jail and in the courtroom. The screenplay also creates a new level of tension by adding a side-plot about Mr. Kirby buying up the block where the Vanderhof/Sycamore home is located. The desire to change the play is understandable. Many filmed plays appear to “stagey” and, because they don’t have the benefit of the energy of a live performance, become dull and static. The date scenes are fun and exciting and the additional scenes with Mr. Kirby allows the audience to see him as a fully-formed character rather than a simple caricature. However, the side-plot takes up so much screen time that much of the dinner meeting between the two families is cut down. The problem is that this scene is the source of most of the play’s humor. In fact, the clash between the two families is the point of the play. It’s why Tony told his parents the wrong night, on purpose. By cutting this scene down, the film loses the sense of what it is actually about. Other changes include cutting the characters of the Grand Duchess and Gay Wellington, both of whom provided additional comedic bits and some gender balance to the play, and the addition of another inventor, Mr. Poppins, who ends up taking away from some of the comedy provided by Mr. De Pinna. The additions and deletions don’t make the film stronger than the original material. In fact, I’ve seen local community theater productions that have more wit and energy than this Academy Award winner. All in all, the film hasn’t aged well. It seems poorly paced, especially for a Capra, who would win his third and final Oscar for the film. Though time has not been kind to You Can’t Take It With You, the reverse is true for the 1939 winner, Gone with the Wind. Although it has been rightfully criticized for its racist depictions and overly romanticized view of the “old south,” the film still holds up as a testament to classical Hollywood filmmaking. Ten years after Wings and Sunrise won the first Academy Awards for Outstanding Picture and Unique and Artistic Production, Hollywood gave us its first truly great epic. The film was nominated for an unprecedented thirteen awards and went on to win in eight categories. In addition, it won special awards for its dramatic use of color and coordinated equipment. It was the first all-color film to win the top prize. It was also the first to win in the new Best Cinematography – Color category, with the award going to Ernest Haller and “Technicolor Associate” Ray Rennahan (future-Citizen Kane cinematographer Gregg Toland would take home the Black and White trophy for his work on Wuthering Heights). And, for all of its racist issues, it was the first film to cross the color line in Hollywood when Hattie McDaniel was named Best Supporting Actress. Though she was forced to sit in the back, in a corner, away from all of the other white nominees during the banquet, she strode with pride and elegance to the podium to accept her award.